He is just so much fun. While we were there, he started babbling nonstop. In fact, one night when we put him back to bed after nursing, he laid in his bed and babbled happily for about 15 minutes before going silent. The cutest thing EVER. On the last day, I managed to get a few with actual Australia in the background- the Sydney Harbor Bridge and the Opera House. 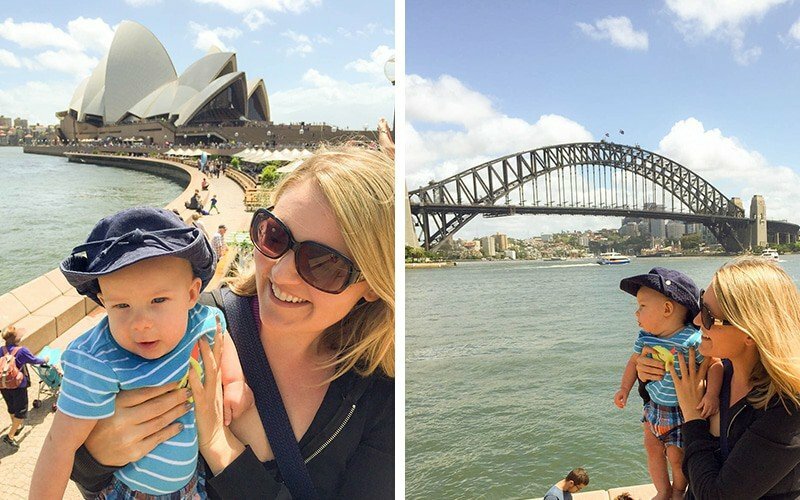 We were only in Sydney for 2 days to break up our journey home. The majority of our trip was in the country where his family lives – farmland! As you can see by the Christmas ornaments in these photos, this recipe was planned for the holiday. It just didn’t get posted! I am planning on making an effort to get a recipe posted every week. Not a lot- working full time and spending time with my new little one is certainly limiting the time I have for other interests! 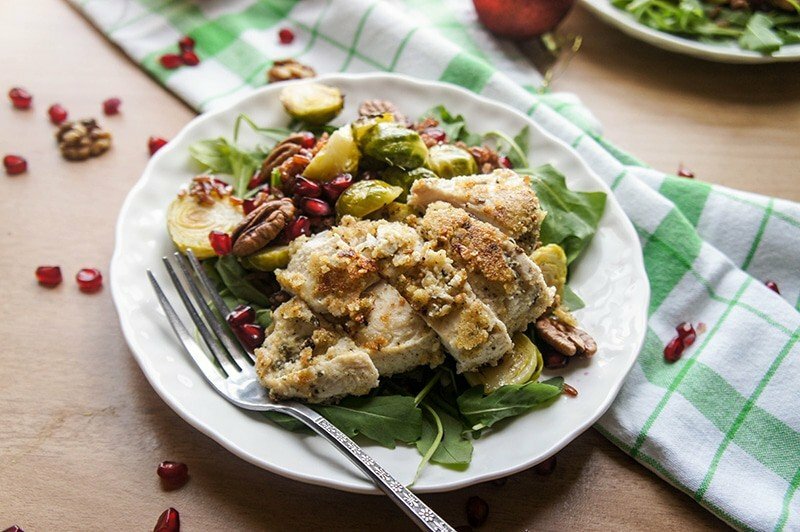 This salad was inspired by my Brussels Sprouts with Pomegranate and Pecans. It just isn’t the holidays without Brussels for me. I love them — and there is always a dish with them at my Thanksgiving and Christmas dinners. I made that dish, and then decided to turn it into a meal by adding greens and rice. Delicious. 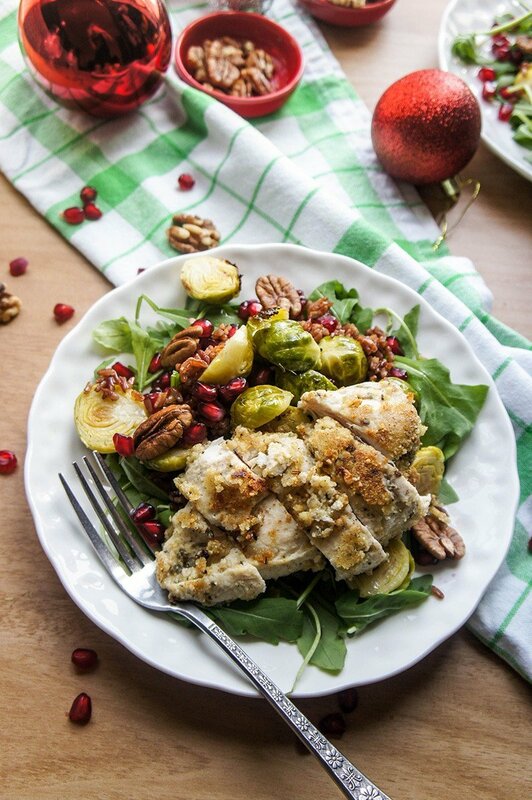 Then, I took it a step further and added my Holiday Almond and Herb Crusted Chicken for a special lunch with a friend. It was a great combination. I also think this salad would work well with my Balsamic Glazed Chicken, if you’d like to add more protein. The salad stands on its own as a meal- I had it for many lunches last month. A warm salad packed with nutritious ingredients! 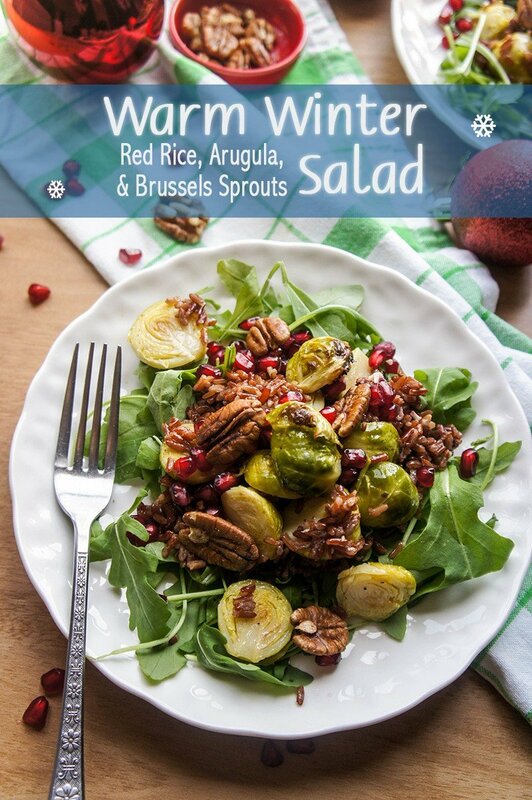 Whole grain red rice makes this roasted brussels sprouts salad a full meal. Add chicken if desired! Preheat oven to 350 degrees Fahrenheit. Toast pecans or walnuts for 10 minutes. Raise oven temperature to 425 degrees Fahrenheit. 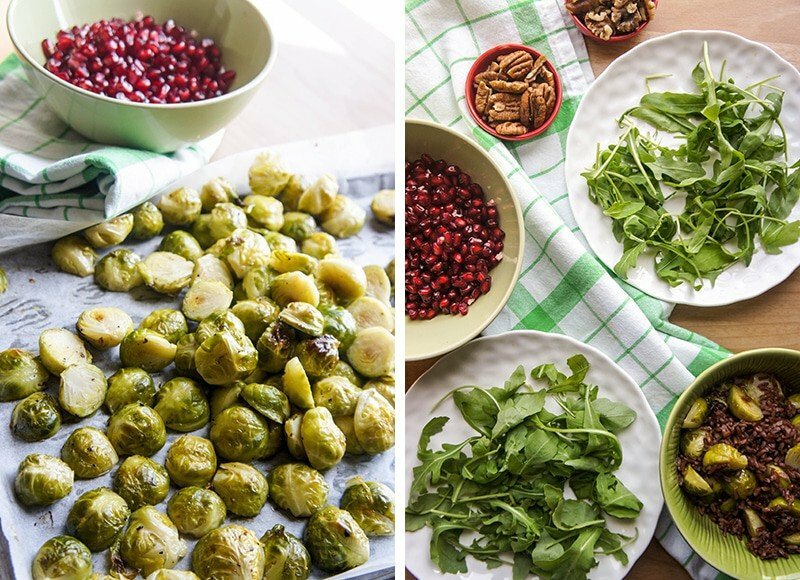 In a roasting pan or a cookie sheet, lay out brussels sprouts, trimmed and cut in half. Sprinkle with olive oil, sea salt, and pepper. Roast brussels sprouts for 15 minutes. I like them crunchy on the outside, but still a bit crisp on the inside. If you like yours cooked well throughout, lower the cooking temperature to 400 and cook for 20-25 minutes. In a sauce pan, add red rice, water, bouillon and butter. Over high heat, bring to a boil. Lower the temperature to low, and cover with a lid once water is boiling. Continue to cook for another 15-20 minutes, until all water is absorbed. Fluff rice with a fork and allow to cool a bit. Mix all salad dressing ingredients together. Once brussels sprouts and rice are cooked, combine the two in a bowl, and mix well with salad dressing. 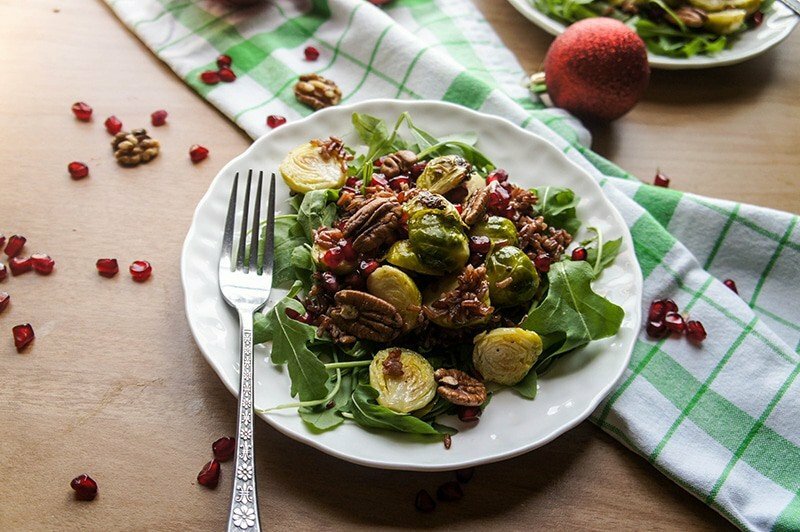 On plates, layer arugula with rice and brussels sprouts mixture, then top with pomegranate arils and pecans or walnuts. Everything about this salad is delish! So nourishing! love the pics of you all! beautiful family and as always, beautiful dish!